Once a year the Toronto arts community gathers together to celebrate the time, the work, the effort, the blood, the sweat and the tears that go into making performances in this city. 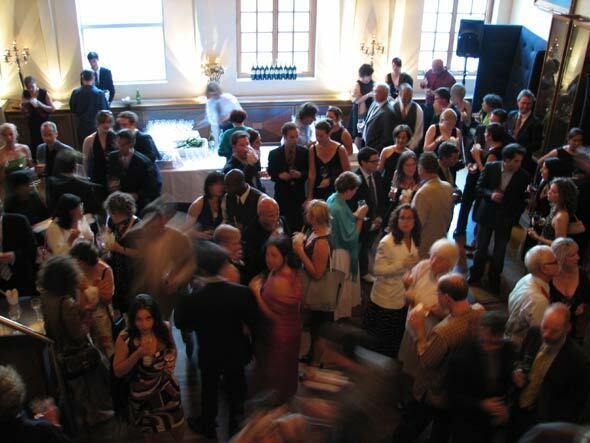 The Dora Mavor Moore Awards celebrate Toronto theatre, dance and opera. The night is full of fun and glitz, perhaps the best way to describe this is that it's like the Oscars of the Toronto stage. Although, unlike the Oscars, when someone is announced as being nominated, no matter how many times the presenters ask people to hold their applause there is hooting and hollering, which, if we're going to be technical, isn't *actually* applause... The overall feeling of the evening is more boisterous and jubilant than the feeling that seems to be at the Oscars. Now, on to the parties... 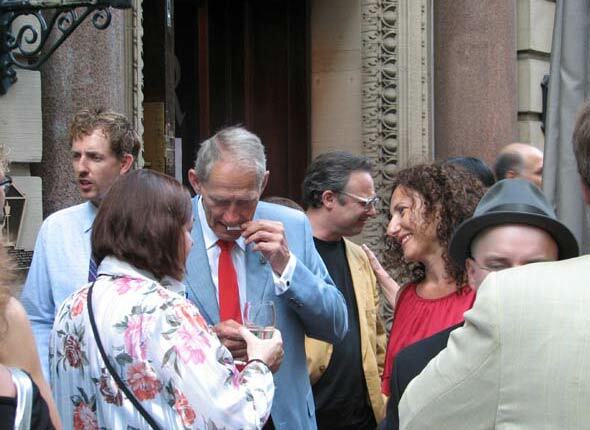 The pre-party was held at the Rosewater Supper Club, and as with any theatre event, the patio (aka the smoking area) was pretty popular. But just 'cause it was crowded outside doesn't mean it wasn't crowded inside. This picture is just of the overflow room, the party was originally supposed to be in one room, but the demand was so high they had to open up more space. 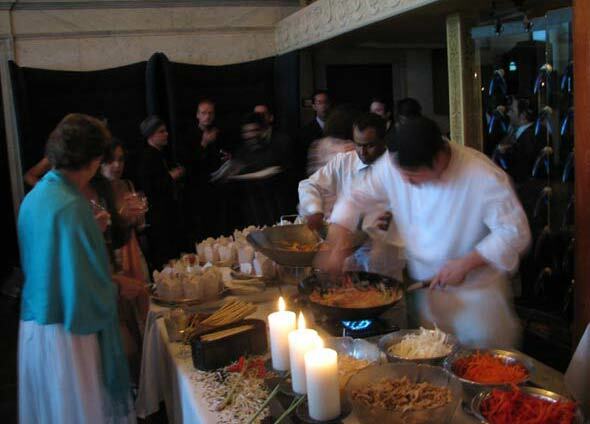 Guests were treated to some tasty food at the pre-party, including this pad thai station. Around 7:30 folks left the Rosewater Supper Club and made their way to the Winter Garden Theatre. It was pretty cool to see lots of people dressed in their finery walking up Yonge street. As we made our way up Yonge I could hear drumming. Very loud drumming. Loud infectious drumming. When I got to the Elgin Winter Garden I found out just what that was. 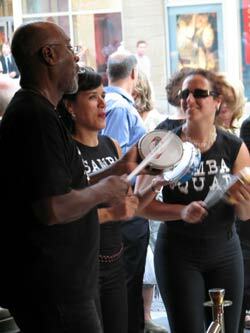 Samba squad was there, lining the red carpet, welcoming people in. The mood was infectious and people all around were soon swinging their hips to beating of the drums. It was a great way to be welcomed into the event. Q: It's a big party, right? So why is it on a Monday night? Why wouldn't it be on a Saturday or something? A: Mondays are the Saturdays of the theatre world. Most theatres are "dark" on Mondays, which means they don't run any productions on Mondays. By having the awards on a Monday night they are significantly increasing the chances of nominees being able to attend. Q: I've never heard of these, are they new? A: Nope, the Doras have been around for 28 years now, but they don't get huge press outside of the theatre world, so unless you follow theatre pretty closely, you likely won't have heard of them. Q: Who is Dora Mavor Moore? Does she sponsor the show? A: Dora Mavor Moore was a pivotal figure in Canadian Theatre. She came to Canada from Scotland in 1896 when she was 8 years old and thank goodness she did. She was a pioneer in Canadian theatre, bringing Canada onto the map, and theatre onto Canada's map. Even the Stratford Festival wouldn't be what it is today without Dora Mavor Moore. So, in answer, the awards are named after Dora Mavor Moore to honour her contribution to theatre and the performing arts. Q: Who decides the winners? A: *UPDATED/CORRECTED WITH INFORMATION FROM TAPA* Any company that is a member in good standing of TAPA may register their production for Dora consideration. The shows are registered by the producing company and the juries are sent notification of the registration. There are 9 - 10 jurors per category, and they will attend shows within that category. Q: Are the awards invitation only?